A week ago I mentioned that I had the good fortune to attend the live taping of a pilot cooking webcast show — at everyday cook — for Borders Books that featured Lidia Bastianich doing recipes from her forthcoming book Lidia's Italy. It was a blast, and I can't wait to see the show! We attendees gradually gathered outside of everyday cook with great anticipation. When we filed into the everyday cook kitchen, we found it transformed into a studio. Cables and equipment everywhere, camera men catching pre-show stills and checking their gear, black cloth over the windows, and temporary lighting hung everywhere to light up the kitchen. The audience area was a series of high cocktail tables dressed with tablecloths, bottled water, and wine glasses. A camera man overheard me as I mused aloud about the best place to sit and he directed us to an unclaimed table right in front of the stovetop. Perhaps it had gone unclaimed because it was tucked tightly between two camera stations and a post. Joe and I squeezed in to the table, and I have to say we enjoyed some of the best seats in the house. Show producer Rich Fahle of Borders welcomed us all and explained how the taping would go. There were be several segments with breaks between each one. We were to be as quiet as possible during the taping and to not leave our seats if at all possible. (But if we absolutely had to get up, please don't waltz in front of the cameras!) Lidia's two co-hosts were Nicole Sims who runs Skip to My Roux and Mark, a Border's executive. 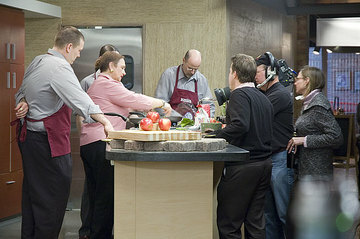 Food TV fans might remember Nic from All Star Kitchen Makeover when she won a kitchen make-over designed by Alton Brown. She was the main host, and did such a professional job that Joe (who didn't know who she was) was convinced she was a moonlighting news anchor. Lidia kicked the show off with a simple appetizer of frico with apples and cheese and from there she mesmerized the audience with her mix of cooking lore and personal stories as she walked Nic and Mark through each recipe. Her enthusiasm was infectious! We were served small bits of the frico and the pasta during the show, along with enough wine to keep us all happy. At the end of the show, the dishes were put out buffet style and the audience was invited to eat. There was no fear of there not being enough food. Even after everyone went through the line, there was enough for seconds. "It was great fun to work with her. Lidia is a consummate professional and also a very kind and warm woman. She also was very generous in her assistance in getting us all ready for primetime, from food prep to blocking out the conversations for the camera. Since I really connect with food and family the way she does, I felt a natural kinship as I really "get" where she's coming from with this book from her heart and it was just like having a friend come over and hang in the kitchen and share meaningful food stories." Ziti with Tomatoes, Eggplant, and Salted Ricotta, with Borgo Maddalena Tocai Friulano 2005. Simple and fresh! Sausages with Fennel and Olives with SFIDA Primitivo/Cabernet Sauvignon Blend. We particularly enjoyed the wine with this one. And for dessert Lidia showed how easy it is (and Nic and Mark showed that it does require a little practice, but practice makes perfect!) to make crepes for Crêpes with Chocolate and Walnuts. Lidia doing pre-show prep. From left to right are Chewy, Lidia, Brendan (behind Lidia), another chef brought in to help, Rich the Borders producer, a cameraman, and Mary, owner of everyday cook. Fennel bulbs are one of those foods that I like but, for whatever odd reason, I never really sought out. Oh Fennel, why did I wait so long to discover you? 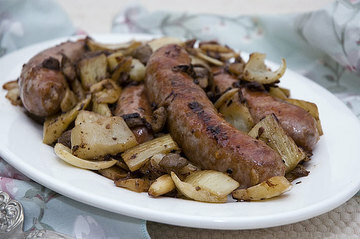 Among the several dishes Lidia demonstrated that night was this sausage and fennel dish. Once the scent of that sizzling sausage filled the air, the whole audience sighed. (Well, maybe not the vegetarians.) I love sausage, and I love olives, and adding fennel... what a wonderful combination. We all received copies of Lidia's new book (consider this self-disclosure that I was given the book for free, but I wouldn't write about it if I didn't actually like it). It's intriguing. It isn't a primer on Italian cooking, nor is it a survey of Italian regional cuisine. 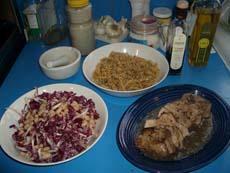 Instead, Lidia chose ten places in Italy that she loves, and presented a selection of favorite recipes from each area. 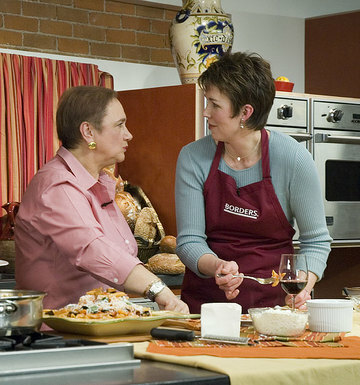 Her daughter, Tanya Bastianich Manuali, added a mini-self guided tour for each region. Between the recipes, the tours, and Lidia's childhood stories, the book has the feel of sharing a personal culinary journey with Lidia. It whets the appetite not only for food, but for travel. Lidia likes her bulb fennel best "in its natural state," but includes several recipes from her Rome section that feature cooked fennel. I present to you this sneak-preview recipe from Lidia's Italy . Lidia has a half-page of advice regarding trimming and cutting fennel. Here's a short version adapted by me: Trim the stalks and tough bottoms off the fennel bulbs. Peel off the outer layer. Cut in half lengthwise and trim out the bits of stalk that go down into the bulb. Cut into 1-inch chunks. I thought I chosen large bulbs, but it seemed like there would be "nothing left" if I discarded the whole outer layer, so I just cut out brown spots and used the thick layer too. It took longer to cook, but was still delicious. Pour 2 Tbs olive oil into a skillet large enough for your sausages and set over medium-high heat. Lay in the sausages and cook for 5 minutes or more, rolling them over occasionally until nicely browned. Pour in the wine and boil until it is reduced by half. Remove the sausages to a platter and pour the remaining wine sauce over them. Add the remaining 2 Tbs olive oil to the empty skillet. Toss in the garlic cloves and cook for a minute or so over medium heat until they're sizzling. (Don't let them burn! Burned garlic BAD!) Drop in the pepperoncino in a hot spot for a few seconds, then scatter the squashed olives in the pan. Toss and cook for a couple of minutes. Add the fennel chunks and stir. Season with 1/2 tsp salt. Cover the skillet and cook over medium heat for 20 minutes, tossing and stirring now and then unti the fennel softens, shrinks, and begins to color. Add a bit of water to the pan if the fennel remains hard and resistant to the bite. When the fennel is cooked through, return the sausages and wine to the skillet. Turn the meat and vegetables together, cook uncovered for another 5 minutes or so, until everything is deeply caramelized and glazed. Adjust seasoning to taste. Serve hot. 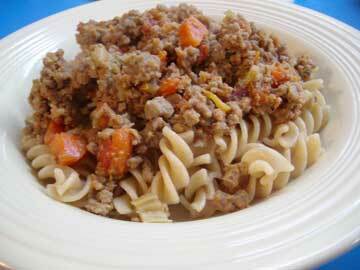 A long time ago (back in 2004), I posted about Hazan's Bolognese Meat Sauce... but I did not post the recipe. Then back in July this past year, "jeex" asked if I would finally post the recipe. So tonight, with some ground beef that needed to be used (or lost), I put a pot of bolognese on the stove to serve as dinner for later this week. It's perfect for cold winter nights. I like to make double batches and freeze some to have later as a fast dinner. Canned tomatoes are one of the great convenience foods of the world. My pantry may be stuffed full, but it feels empty to me if I don't have at least a few cans of tomatoes on hand. If you've got canned tomatoes, an onion, garlic, some spices and herbs, some olive oil, and some pasta (or gnocchi in this case) you can have dinner in 25 minutes or less, depending on how fast you can chop that onion and garlic. If you have a bit of red wine to add to the sauce (you know, half-empty bottle in the fridge left over from a holiday party), then all the better! Start your water boiling for the pasta (or gnocchi) first thing and then it should be ready to go so that you can cook your pasta during the last 5-10 minutes that sauce is cooking. I had left over wine and garden tomatos begging to be used in a bolognese meat sauce. And I knew in advance that I would need a quick dinner for tonight. So I put it in the pot to simmer Monday night and put it in the 'fridge. When I got home from work, alll I needed to do was cook the pasta and warm the meat sauce. While the pasta cooked, I made a quick salad of baby spinach and rocket with toasted pine nuts and apples. I'll try to remember to add the ragu recipe here when I have a chance. 1) Soak raisins in 1/4 up red-wine vinigar and 1/4 cup water for at least 30 minutes. Then drain, forcing off additiona liquid by squeezing the raisins in your hand. 3) Put 1/4 cup olive oil and all of the sliced onion in a large saute pan, turn on the heat to very low, and cover the pan. Cook the onion very slowly, turning it occasionally, until it is very tender. All liquid must evaporate, and the onion should become a blond gold color without browning. Transfer the onion to a plate using a slotted spoon, leaving behind as much oil as possible. Sprinkle the onion with salt and set aside. 4) Add the remaining 1/4 cup olive oil to the pan and turn heat to medium high. 6) Brown the meat well on both sides. If it has been pounded very thin, do not cook for more than 5-6 minute total. 7) Transfer meat to a large serving platter. The less it overlaps the better. Sprinkle with salt and a few grindings of black pepper. 8) When all the meat is cooked, returned the onion to the pan. Add the pine nuts, raisins, the remaining 1/4 cup red-wine vinegar, and 2 tablespoons of water. Cook, stirring, for a minute or two. Turn off the heat and stir in the balsamic vinegar. Pour the contents of the pan over the meat, sprading them evenly. You can serve it immediately, or you can refrigerate it and serve it at room temperature later. The longer it steeps in the balsamic vinegar, the deeper the flavor. Have some good bread on hand for sopping up the sauce. Absolutely delicious. This is why I have an herb garden. Have I mentioned that before? Mash the garlic and remove the peel. Put garlic, rosemary, and butter in a saute pan or small sauce pan and turn heat to medium. Cook, stirring frequently, for 4 to 5 minutes. Add crushed bouillon cube. Cook and stir until the bouillon is completely dissolved. Pour the sauce through a fine strainer over cooked and drained pasta. Toss. Add parmigiano and toss again. Serve with additional grated cheese on the side. Set enough salted water for the spaghetti to boil. While waiting for the water to boil, prepare the tomatoes and herbs and put them in a large bowl. When water is boiling, add spaghetti. When the spaghetti is nearly done, heat the olive oil over high heat until it is smoking hot. Pour it over the tomatoes and herbs. It should sizzle. Add salt and pepper to taste. When pasta is barely tender but firm to bite, drain well and transfer to the bowl with the tomato-herb mix. Toss to mix ingredients and serve. It's one of those days. Joe is running late at work, and if I'm lucky, I'm going to have an hour to cook dinner and get out to my evening meeting. We get home, and I have 30 minutes to cook, eat, get ready, and leave. I had planned to make Pan-fried Steaks with Tomatoes and Olives. You can't possibly do this in time, Joe says. All I had eaten that day was a bowl of cereal and a frozen pad thai dinner. I was going to eat that steak, and no one was going to stop me. - purchase almost 2 lbs of steak suitable for pan frying. To save time, have the butcher slice it thin, say 1/4 inch or so (must be under 1/2 inch thick). Lots of leftovers! Yah! - purchase a baguette to go with dinner. Be really lucky and get the last baguette. 0) If your steak slices are thick, you'll need to flatten them first and slit the edges so the meat doesn't curl while cooking. Mine were very thin, so I skipped this step and saved a lot of time. 1) Heat 3-4 Tbs olive oil in a large pan. 2) Slice one medium onion in thin half circles. Add them to the pan. 3) While onion cooks (stir occasionally), thinly slice 4 garlic cloves. Open can of tomatoes and measure out around 1 to 1/3 cup tomatoes. 4) When onion is pale gold, add garlic. Stir. 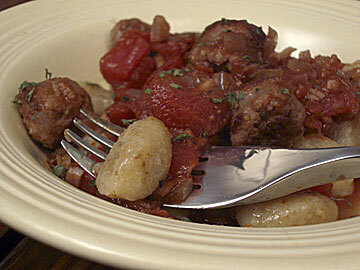 5) When garlic is pale yellow, add tomatoes, olives, and 1/2 tsp of dried oregano (1 tsp fresh). Stir. Cook 15 minutes. 6) Quickly quarter about 24 olives. Remember to stir the sauce. 7) While sauce is cooking, heat cast iron pan until hot. Swipe with a bit of vegetable oil. 8) Wait long enough for sauce to be almost done, then cook steak slices a few seconds on each side. Sprinkle with salt and pepper as you turn them. Nibble on small bits and swoon, because few things beat medium-rare steak fresh off the pan and still sizzling. 9) When oil floats free of sauce, add olives and cook 1 more minute. 10) Transfer meat to sauce pan and coat the meat slices. 12) Do not take the time to photograph the dish for the blog. 13) Load up with food and stuff face quickly. Tell yourself you'll get the enjoy the leftovers at a more leisurely pace tomorrow. Run out the door, running only 5 minutes late but confident that a sufficiently fast car can get you anywhere on time. Recipe from Marcella Hazan's Essentials of Classic Italian Cooking. It's Sunday and 6pm, and unless I think fast, it's going to be "let's order in." I rummage through the freezer and take stock of the few "emergency" meats I keep on hand. (With a butcher's shop right on the way to my car after work, I like to buy fresh the day that I'm going to use it.) Some boneless chicken breast, a skirt steak, flank steak, and boneless pork loin. Hmmm... maybe Italian? Okay, let's check out what Marcella Hazan has to suggest. I pull out her Essentials of Classic Italian Cooking. I find a suitable pork loin dish. Now I all I need is a vegetable and a starch. I glance at a carrot and caper dish, but recall that I have a head of radicchio in the fridge. Hazan comes through again with a radicchio and bean salad. Perfect. The salad recipe requires cranberry beans, but says that cannellini can substitute. Cranberry beans I have not. I do have dried cannellini, but I lack a time machine that will let me turn the clock back 24 hours so I can soak them. Digging through my shelves turns up a can of navy beans. Good enough for me!